IE Business School - International MBA | ﻿The MBA is about inspiration and electricity! ﻿The MBA is about inspiration and electricity! Some of IE Business School’s most outstanding alumni are working in Asia, and this week Joël McConnell, IE’s Director of International Development for Asia Pacific, caught up with Germano Rollero: an International MBA graduate based in Beijing who is currently working for one of China’s major civilian aviation companies. JM: What brought you to China, and what are you doing professionally right now? GR: I came to China because I’ve always been fascinated by this country, so much so in fact that I chose Chinese as my Major subject during my undergraduate degree. Not surprisingly the majority (I’d say about 90%) of my professional career has taken place here in China. Currently I’m part of the Global Corporate Accounts team at Air China International, the most important Chinese carrier. Air China is a state-owned enterprise and it has been one of the most profitable airlines in the world for each of the last 5 years. Consequently, the company is ambitiously growing beyond China’s borders. It’s very interesting being part of a company that is growing globally so quickly, it almost feels like I’m a pioneer, or better said: part of a team of entrepreneurs at a start up that has 25.000 employees. In my everyday work I supervise the efforts of our offices around the world, with the objective of improving our service and growing our revenues from primarily global Fortune 500 corporate clients. I do also business development globally to find new corporate clients, signing global deals with them. Our team is at the forefront in making Air China a more global airline. JM: How did your MBA experience at IE Business School help you get to where you are today? GR: The MBA helped me because it made more confident and outspoken. I am not a finance major, I was not working in investment banking or in strategy consulting before the MBA, but some of my classmates covered these topics. At the beginning, I was kind of more reserved when expressing my own views about the cases discussed in class and our work groups because my classmates had more knowledge about these subjects. After some time though I realized that my fresh take and views on the cases were adding a lot of values to the discussions, actually many times much more value than the views of my more experienced peers. I gained more self-confidence and I became more capable of establishing a vision and of instilling enthusiasm in others. 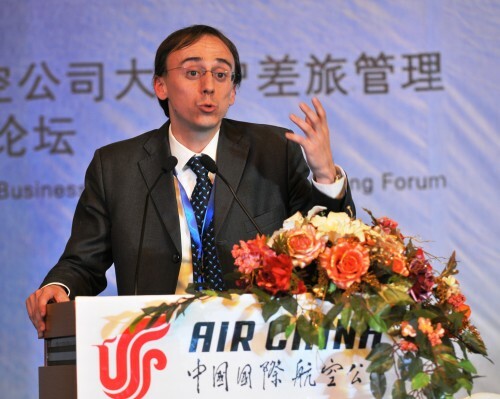 My MBA experience helped me at Air China, in fact in addition to my day-to-day job I am asked to attend many other project team meetings related to the future of the company, because of my ability to express new ideas and points of view about complicated problems and unclear situations. JM: What do you remember most fondly about living in Madrid? GR: Without a doubt the friends I made at IE. It was great to be surrounded by so many wonderful people full of enthusiasm and creativity. You feel so much inspiration and electricity on campus, and Madrid helps you to bond with them, given the many opportunities to network and have fun in the city. Furthermore, after the MBA you become even closer with all your peers. Even though they’re scattered around the world, you know you can count on them should you need to ask them for help. JM: Any tips on applying to the program, especially with regards to the admissions application? GR: Focus on your dreams and on what you want to achieve after the MBA, and you will find the enthusiasm and the motivation to go through all the steps of the application. It’s tough, but the MBA experience at IE is worth it! JM: Where do you see yourself in 2 years? GR: I see myself in an overseas assignment with Air China, leading globalization efforts in foreign markets to help Air China to become one of the best airlines worldwide.